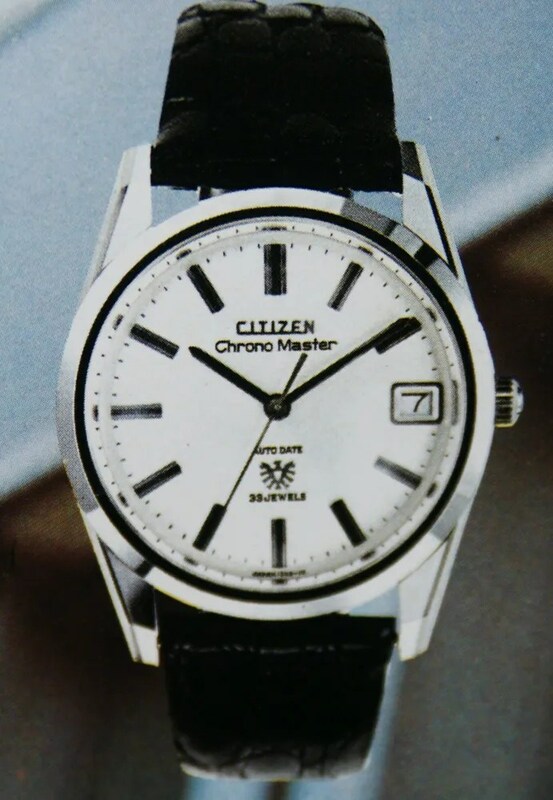 The Chrono Master is a ‘high-end’ watch that first appeared in Citizen’s line-up in 1967. 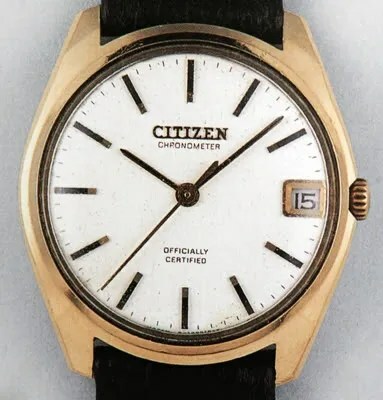 Although it was not the first of Citizen’s watches to include chronometer grade movements, since it was preceded by the hand wound ‘Chronometer’ (1962), it featured a range of models in both hand-wind and automatic forms, and has probably become Citizen’s most recognised high grade vintage watch, especially since modern versions have also been produced. 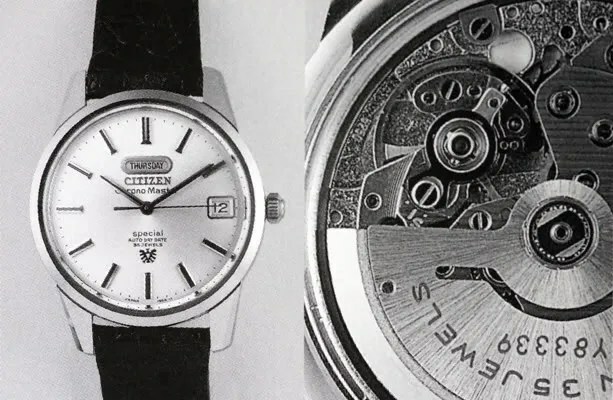 Although there are other high end lines by Citizen, including the Chronometer and models in the Leopard line-up, the Chrono Master is probably the best known. 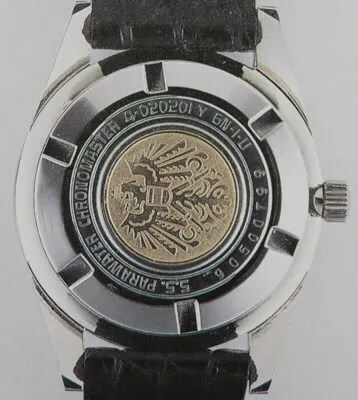 The Chrono Master is distinguished by the name itself on the upper part of the dial, an applied stylized eagle emblem at the 6 o’clock position and the same motif in a gold medallion applied to the centre of the case back. 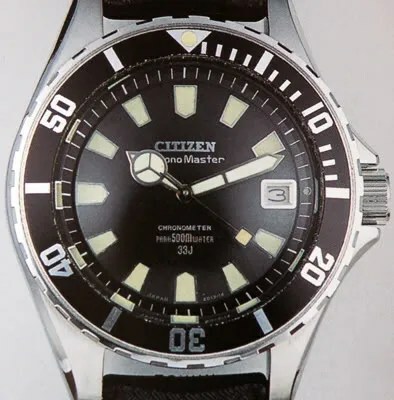 Citizen also made a Chrono Master version of its electro-mechanical watches, and I have included it in Part 2 of this article, alongside the automatic models. All Chrono Master case backs are marked ‘Parawater’, other than than the solid gold hand wound model, which has a plain back. Lug sizes – it appears to me that two lug widths are used, 18mm and 20mm. I indicate which model / case uses which width as far as I can, but add ‘?’ where I am not absolutely sure. 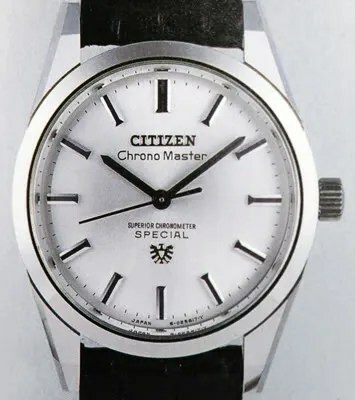 I know that my own Chrono Master is 20mm, and it appears to me from catalog images that those models sold with a steel bracelet used this width. Those with leather bands only appear to be 18mm. 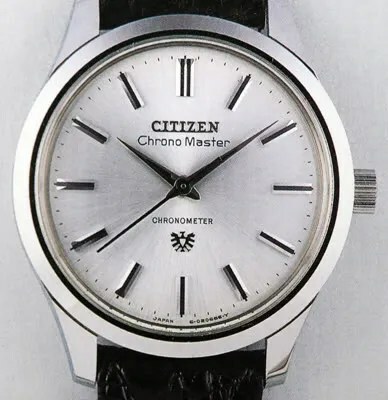 The 1967 Models: Citizen launched the Chrono Master in automatic and hand-winding forms in 1967. Two hand wound models were produced in the first year, using movements 0920 and 1870 respectively. The obvious outward differences are that the 1870 has a date wheel and higher jewelling – 25 rather than the 22 found in the 0920. 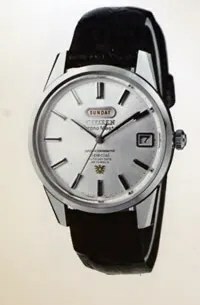 Their specifications are very similar, and they were part of the ’02’ family of movements indicating that they were developed and highly tuned versions of the humble ‘Homer’ range (first produced in 1962). This is immediately clear from the date version of the Homer which uses movements designated 18xx, with the Chrono Master using the 1870 variant. 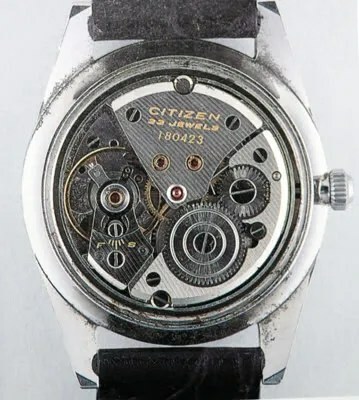 Two variants of each model were made, one with ‘CHRONOMETER’ on the dial, suggesting a higher degree of adjustment, and reflected in its price at the time (see below). 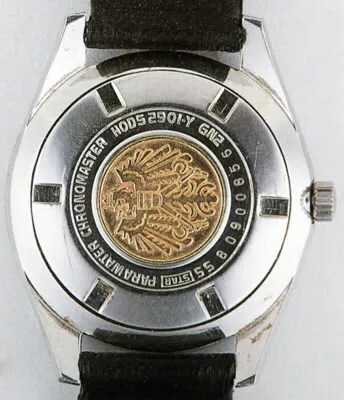 The Chrono Master case back is notable for its gold stylized eagle medallion. Both versions run at 18,000 beats per hour, and the movements are both 25.60mm wide, with a depth of 4.00mm. I believe that the movement has ‘second setting’ or ‘hacking’, i.e. 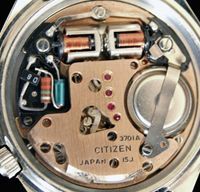 the movement is stopped when the crown is pulled out to the time-setting position, to allow accurate synchronisation, as do the automatic versions. Both types were also produced in 18K gold. 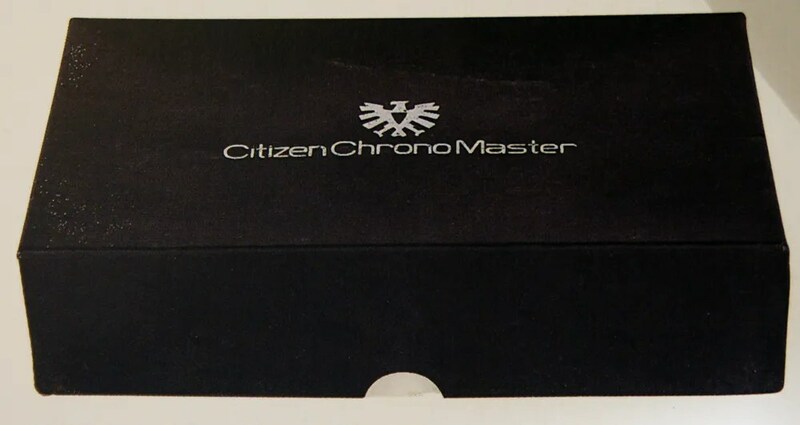 However, the solid gold variants were not marked as Chrono Masters, but were more simply marked ‘CHRONOMETER’, ‘OFFICIALLY CERTIFIED’ and have a (very) plain case back. 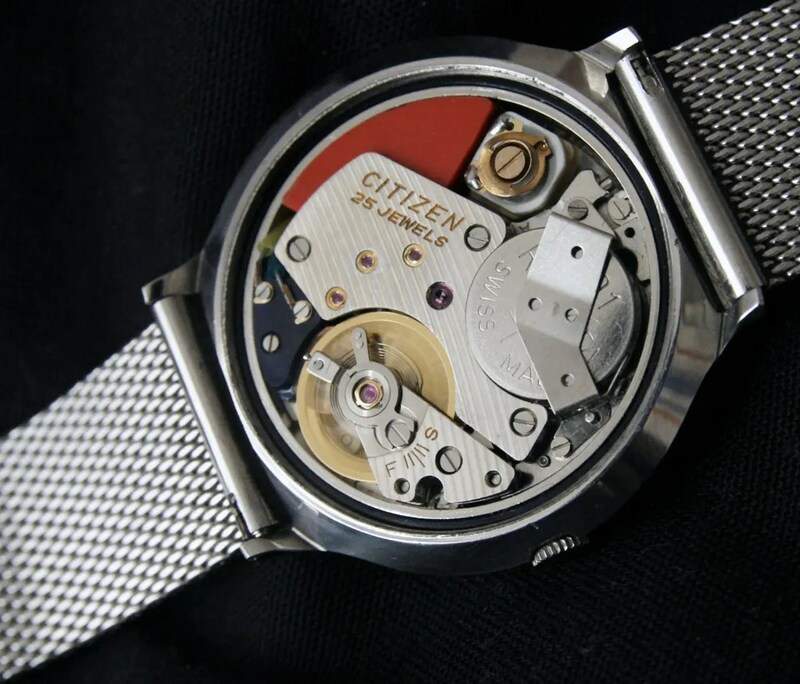 The 1968 Models: The following year saw the launch of the 0930 movement, extending the range with even more finely tuned movements. 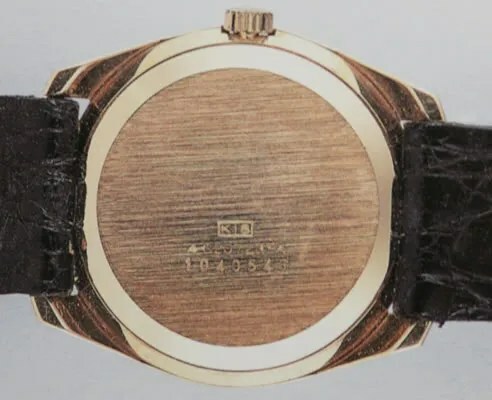 Two dial variations are found, one simply marked ‘Special’, achieving chronometer grade, and the other marked ‘SUPERIOR CHRONOMETER’ as well as ‘SPECIAL’, suggesting accuracy better than standard chronometer grade. 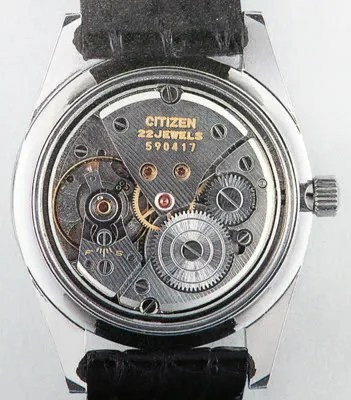 No additional date models (1870 movement) were launched. 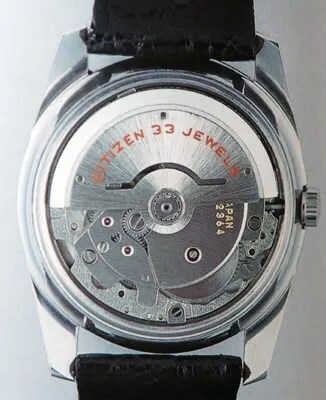 Notably, the 0930 22 jewel movement now featured a fine adjuster on the balance, not found on the earlier two movements. 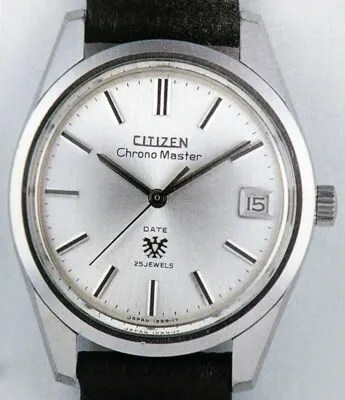 Citizen launched all bar one of their automatic versions of the Chrono Master in 1967, the same year as their first hand-winding model, and were produced until 1972. 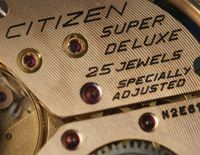 The movement is essentially the same for each version, in either 33 or 35 jewel form, but with extra adjustment to justify ‘Chronometer’, ‘Special’ and ‘Superior Chronometer Special’ grades. 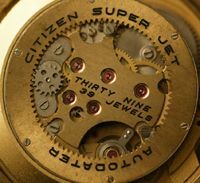 The two ‘Special’ (35 jewel) movements also have fine adjusters on the balance. 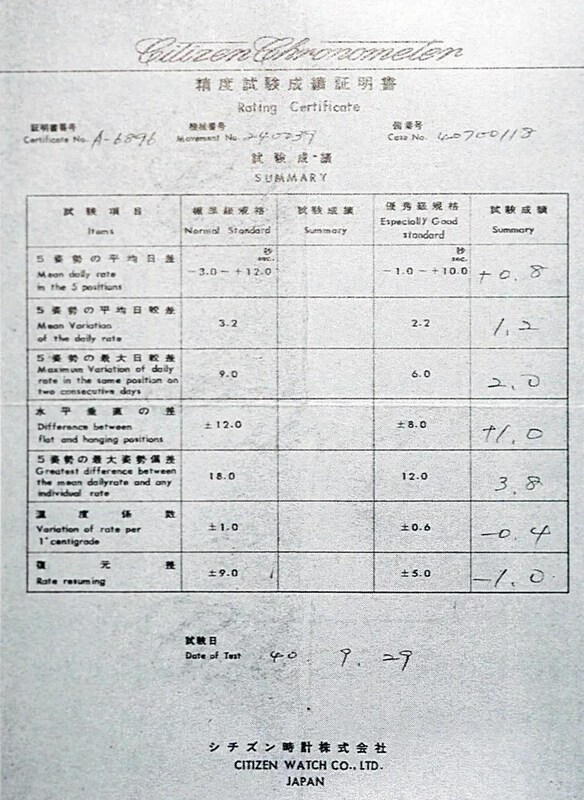 The pricing structure (see later) also follows the degree of adjustment and therefore accuracy achieved at the factory. 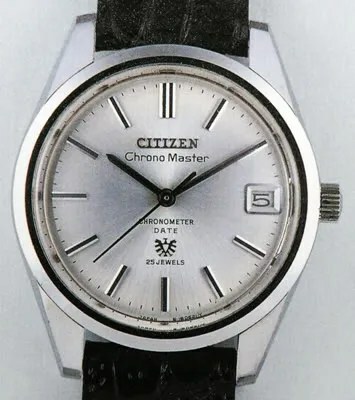 I have not been able to find any accuracy certification specifically for the Chrono Master, but I have included an example for Citizen’s 1962 ‘Chronometer’ in Part 1 of this article for reference. As with its hand-winding namesake, all but one version of the automatic Chrono Master models, which are all cased in stainless steel, feature a gold medallion on the case back. 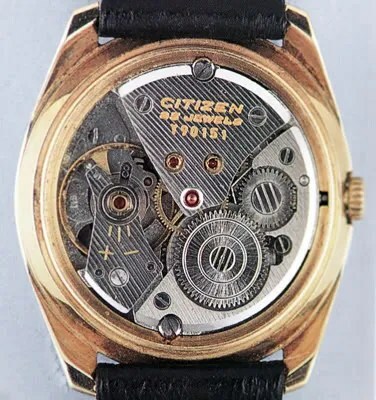 There were no gold plated or gold-filled Chrono Masters, only the solid gold versions of the hand winding model as described in Part 1. 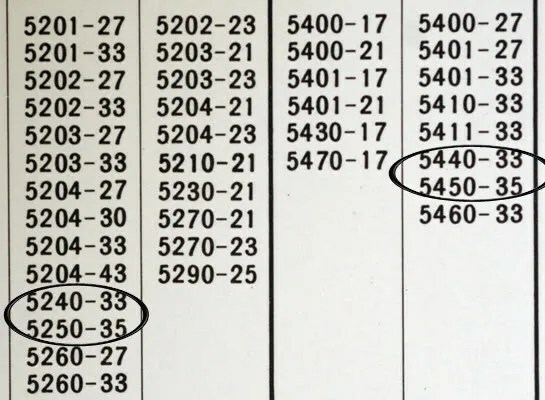 The day window on the 5240 and 5250 models is oval in shape. 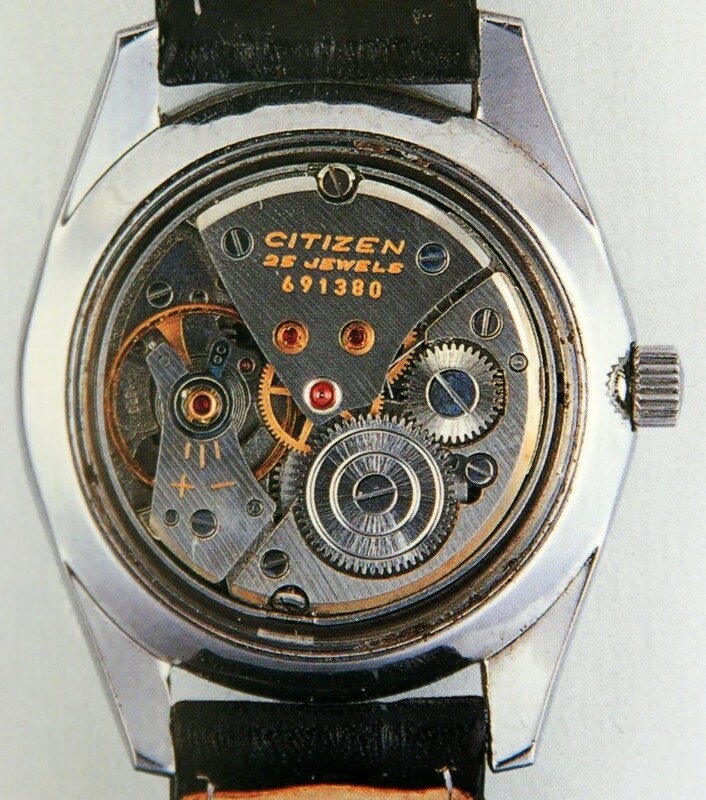 One more version of the automatic line was produced, in 1971, in the form of a diver depth rated to 500 meters. 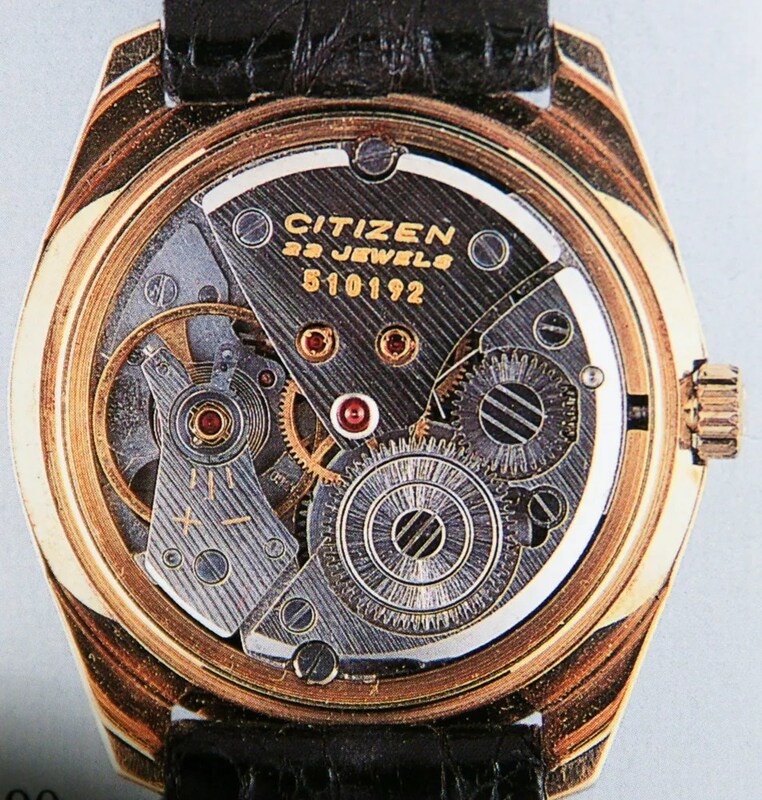 This is a very rare piece, using the 5420 date only movement with 33 jewels. 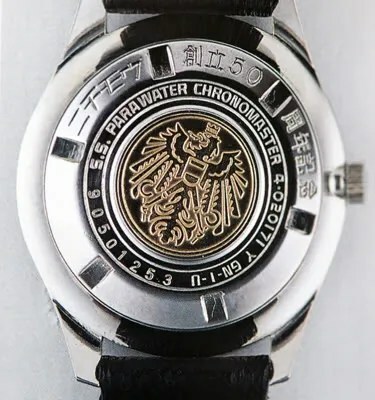 The dial is marked ‘Chronometer’ and ‘auto date 33 jewels’ has been replaced with ‘PARA500mWATER’ and ’33J’. 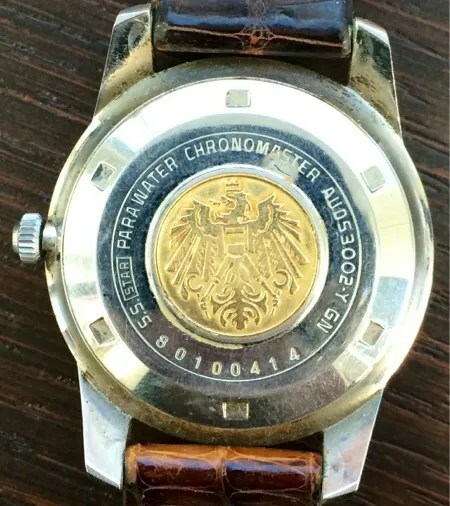 The one piece case has a stamped emblem on the back rather than a gold insert, and is marked 4-540263. 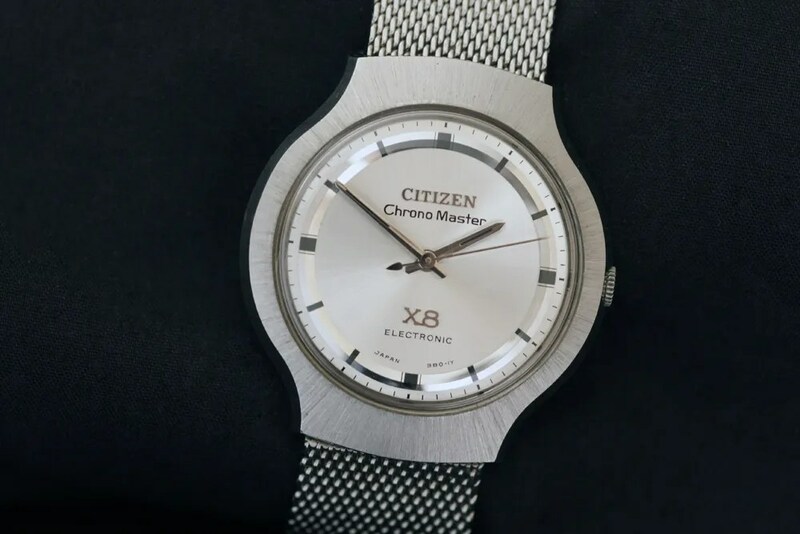 First produced in 1969 as part of the ‘X8’ electro-mechanical watch line this model was a more developed version Citizen’s pioneering ‘Electric Watch’ of 1966, using the 0802 movement. 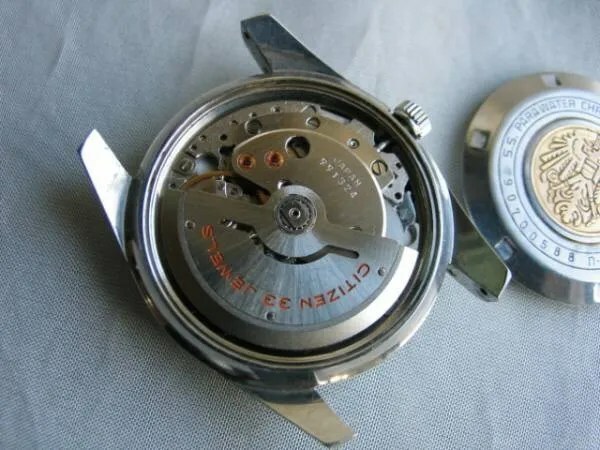 In these watches the traditional mainspring is replaced by a battery and integrated circuit, which then powers a conventional hairspring balance albeit fitted with magnets. 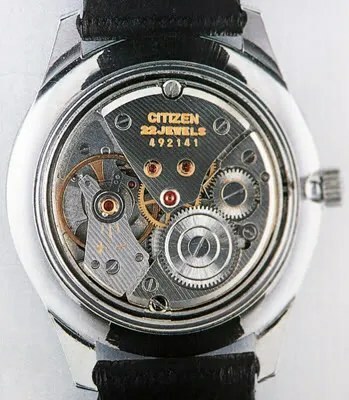 Although the 0802 movement ran at 18,000 beats per hour powered by its 1.5v battery, the subsequent ‘Cosmotron’ models using later hybrid movements ran at 36,000 beats per hour, and in one case 43,200 beats (i.e. 12 beats per second). 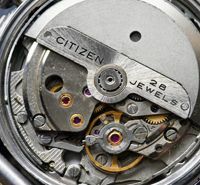 The 25 jewel 0802 movement had only a short production run, reflecting the rapid development of the technology. 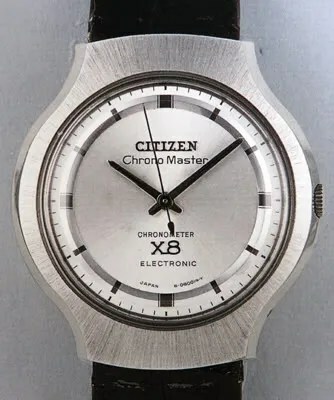 However, the use of the Chrono Master name, and later other X8 models which were labelled ‘officially certified chronometers’, indicate their ability to run very accurately, at least within the parameters of fully mechanical accuracy standards. The standard Chrono Master dial is pale silver with polished steel baton hour markers which have a black centre line. This style is repeated on the main hands, which are of a fairly narrow non-tapering design. The black centre line runs the full length of the hands. Second hands are steel and are generally the same on all models, tapering to a point from a long tail, reaching about half way along the hour markers. The hour markers and main hands on the 18K gold Chronometers look to be similar but narrower, whilst the second hand looks longer although this may be the result of the use of a smaller dial. 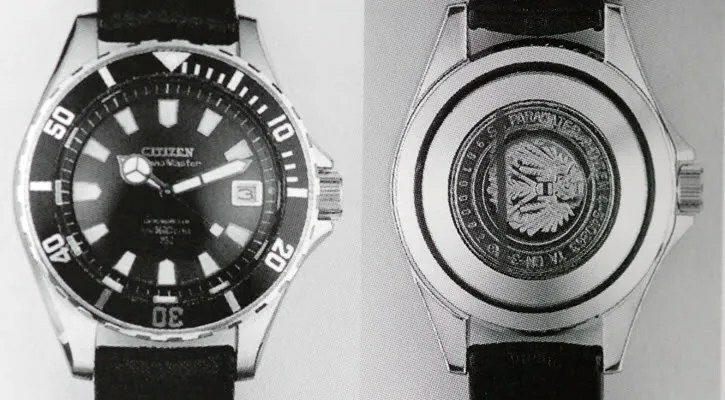 The diver is the only black dial in the Chrono Master line-up as far as I know – I have seen one Auto Date model with a black dial but it looked to me to be a re-dial. 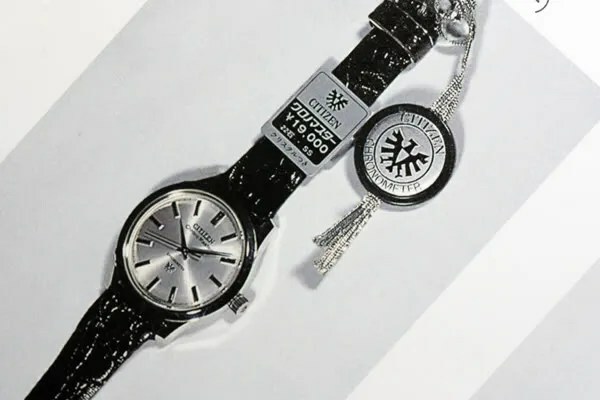 Not only was it black, not seen in any catalogs, but also the positioning of the dial text was not quite right, at least in my opinion. 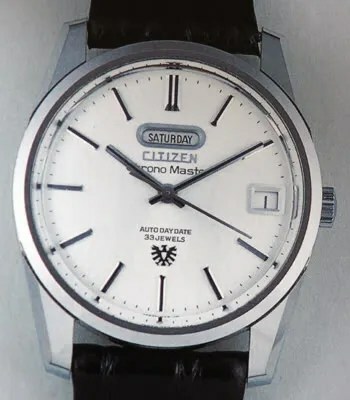 I have seen three other Chrono Masters which don’t fit the above descriptions, none of which I can verify as authentic models, but I include them here as at least being of interest and potentially correct original pieces. 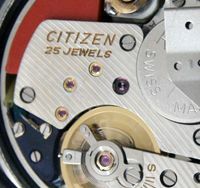 The movement has a serial number indicating that it is the chronometer version of the 33 jewel movement. 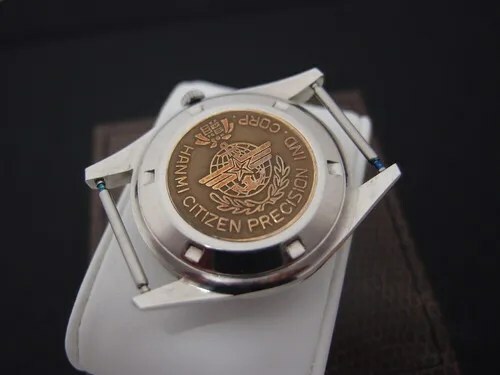 As can be seen it is marked ‘Hanmi Citizen Precision Ind Corp’ which was the name of the factory Citizen established in South Korea in 1974, later known as Citizen Precision of Korea Co., Ltd. 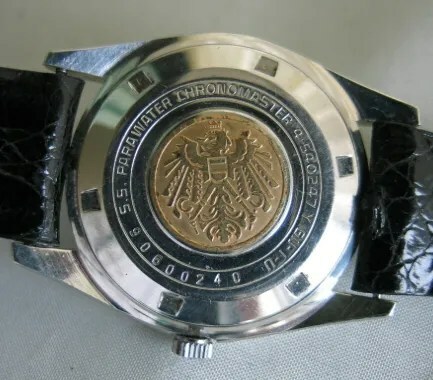 The quality of the back suggests to me that this is an authentic piece. 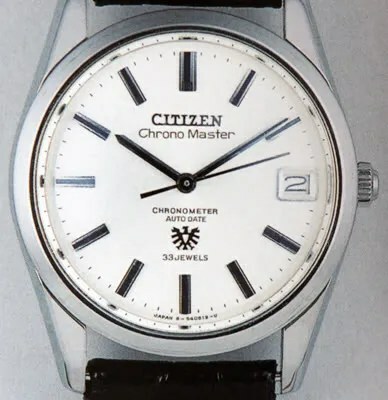 Thanks for the research and invaluable reference material; I have acquired four chrono masters, as follow: 1. a 25j Chrono Master date, HOD50291-Y; 2. a Chrono Master , auto daydate 33 jewel, AC552929-Y;3. 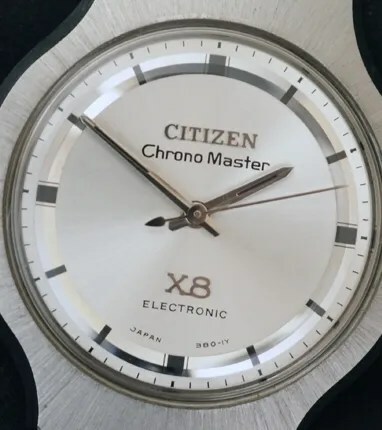 A Chrono Master auto date 33 jewels, AUD52910-Y and 4. a Chrono Master X8 Electronic, ELCS 5021-Y; you might be interested to know I also have a Citizen Chronometer, Officially Certified Automatic Super Beat 10, 4-740041 Y; and finally a Citizen Crystal 7, 43 jewel AC552924-Y. The date window is above at 12 date at 3 Just Love her. I have a really nice Crystal 7- 43 J but she needs some Crown attention . 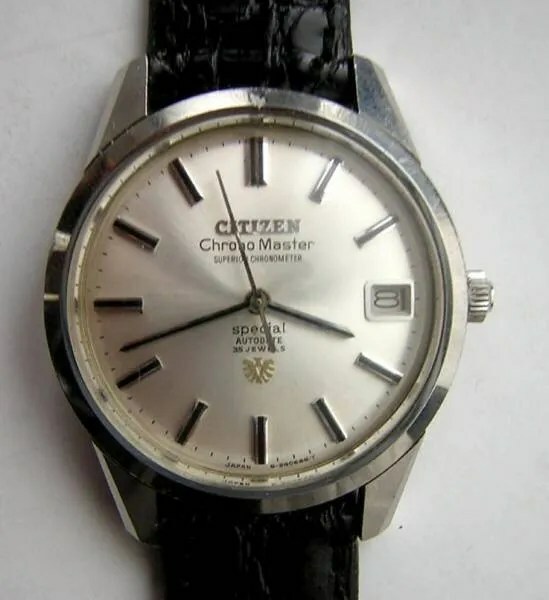 Hi Russell, it’s great to hear form you and thanks for visiting my blog 🙂 Good to hear that you are impressed with your Chrono Master and that it compares favourably with your vintage Grand Seiko’s. I’ll be updating and uploading Part 2 of the article soon, so I hope you have time to take a look at that. What is the problem with the Crystal Seven crown? cheers from one of your Australian followers. You’re welcome 🙂 I might do a page on how to interpret the earlier style case back codes, for example ‘ACSS’ = Automatic; Crystal (i.e. hardened mineral glass); Seven (i.e. includes date and day complications); and Steel. Hi Stephen, I appreciate the great research and compilation that you’ve accomplished. It will surely be used by collectors and enthusiasts for years to come. 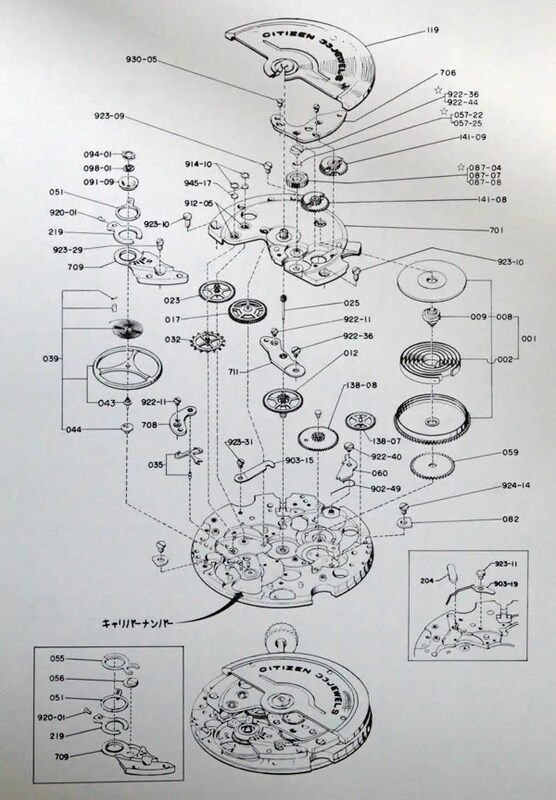 I’ve been looking at a basic ’67 22J/ 0920 hw Chrono Master. It has a ‘CTZ” crown. 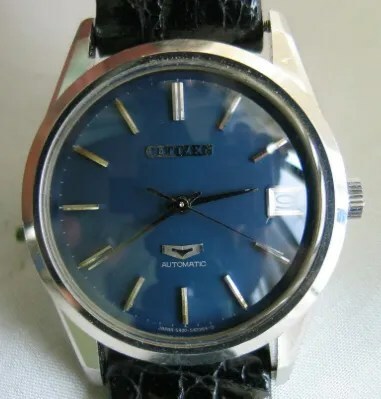 Based on your work it is likely a replacement, especially since the dial is a nice repaint. Condition looks very good otherwise, with very clean movement but moderate gold medallion wear. In your opinion do those refurbishments reduce the value much? Rather than (emotionally) overspending on this one the money could be used toward a high end modern Citizen GS-equivalent import. Do you think the CM 0920 would be up to the challenge of everyday use? One more question … I have a nice leopard 8 that auto-winds well, but does not wind manually. Assuming that it should (! ), is the repair fairly straightforward to do? Thanks again for your generous research legacy. Although there’s clearly a place for well restored pieces that otherwise would have been in poor condition, restorations need to be error free! 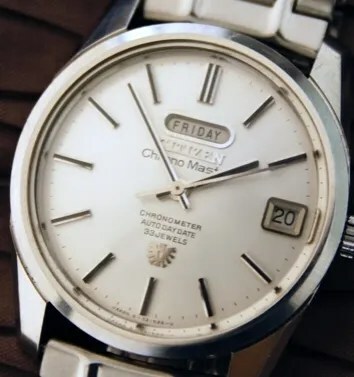 I saw a ‘Center Second’ model with a re-finished dial, which looked very nice except the text was spelt ‘Senter Second’…. It’s your decision of course, but personally I would pass on this one. As to the Leopard, as far as I know all models should hand wind – does the crown moves freely in both directions, and can you hear any clicking as you turn it especially anti-clockwise? I’m not a watch maker but I can make enquiries for you. Which model do you have? 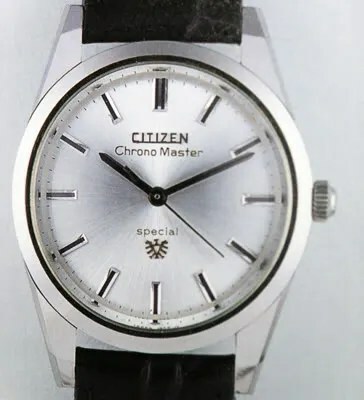 Hi Marvin – I should have said in my first reply that I think the Chrono Masters should be good for everyday use, providing they are running accurately, so not already showing signs of significant wear, and have been fully serviced by a skilled watch maker. 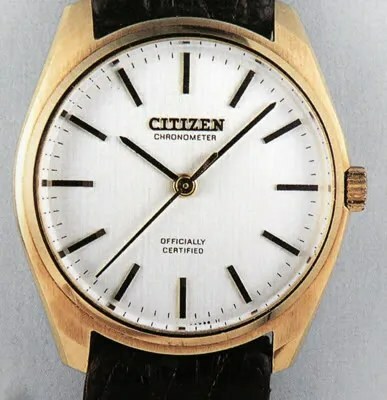 The CM movements run at 18,000 beats per hour, so are not as susceptible to wear as the high beat models like your Leopard, so they should be OK for regular use providing they have been well looked after. Wow, thanks Stephen. I’m disappointed, but grateful. You saw the one I was looking at. Handsome design. The markers didn’t feel quite right, but I failed to notice they were reversed! My eye isn’t yet as sharp as it needs to be to comb through these old watches. It should have been obvious. You’re also correct on the polishing job – it hides the wear but softens the original design appearance. 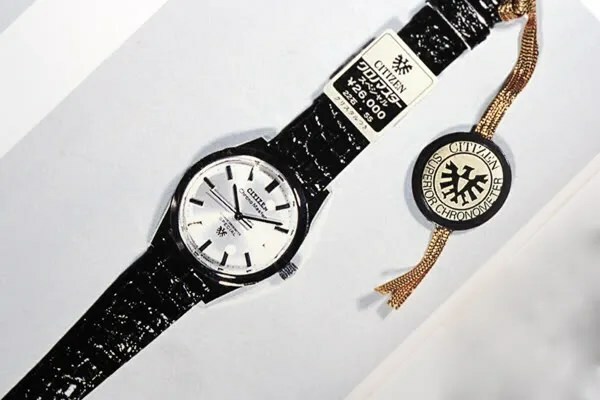 Rather than spending the (assumed) $350-450 on a faulty restore it would be better put toward another worth collecting. Thanks for the schooling. On my Leopard, my favorite, it’s a 1971 Super Beat 8 /26J. 4-7600!B Y, 10321667, GN-1-S. (I’d be happy to send you pics if you send your email address.) 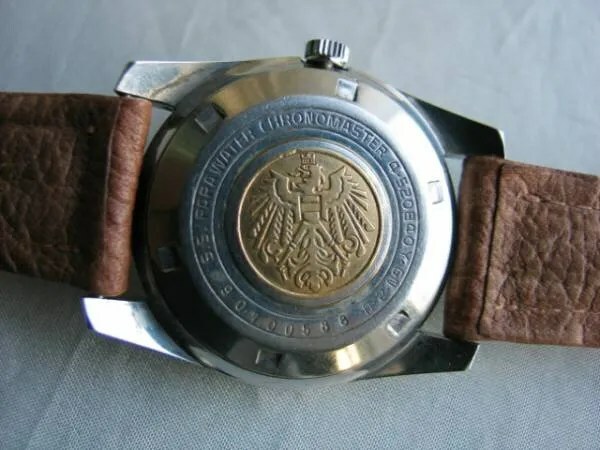 The old metal band isn’t original to the watch but is serviceable until fortune turns up an original. It needs a good service, seals, etc. despite what a seller indicated, although the accuracy seems good. The outer case is a bit dirty which may be a positive, since it wasn’t polished to death. The stem functions easily and smoothly clicks anti-clockwise, but will not turn clockwise with firm pressure. You’re welcome Marvin 🙂 I think you’re right about putting the money towards a better example. My 4-760018 Leopard is a fairly close relative of yours – the serial number is 10320791. Should definitely hand wind, and since it’s stuck in the clockwise direction, there is obviously something amiss but I’m not a technician so I can’t help any more with diagnosis! Since the watch is running well otherwise, hopefully it is a relatively minor problem, and it is still perfectly usable with auto-winding. 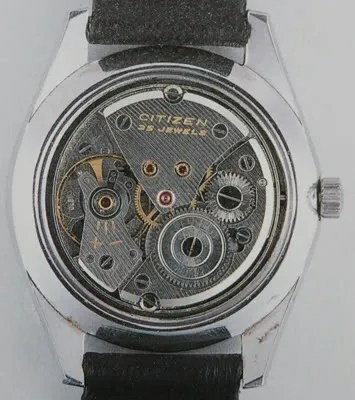 If you do send it for service / repair make sure you find a skilled watchmaker who is used to working on vintage mechanicals. Hi, very lovely and informative page. 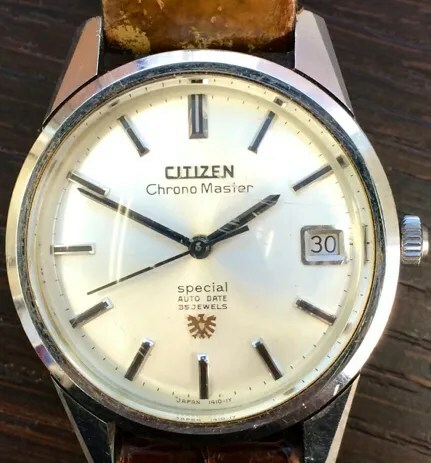 I bougth a chrono master in a flea market in Mexico city. Some people say in the internet that is not real but with your page I find that a 27 jewels calibre 5003 exist with 27 jewels as it’s mine. But The dial on my day date waych say 33 jewels and the day is in Spanish. 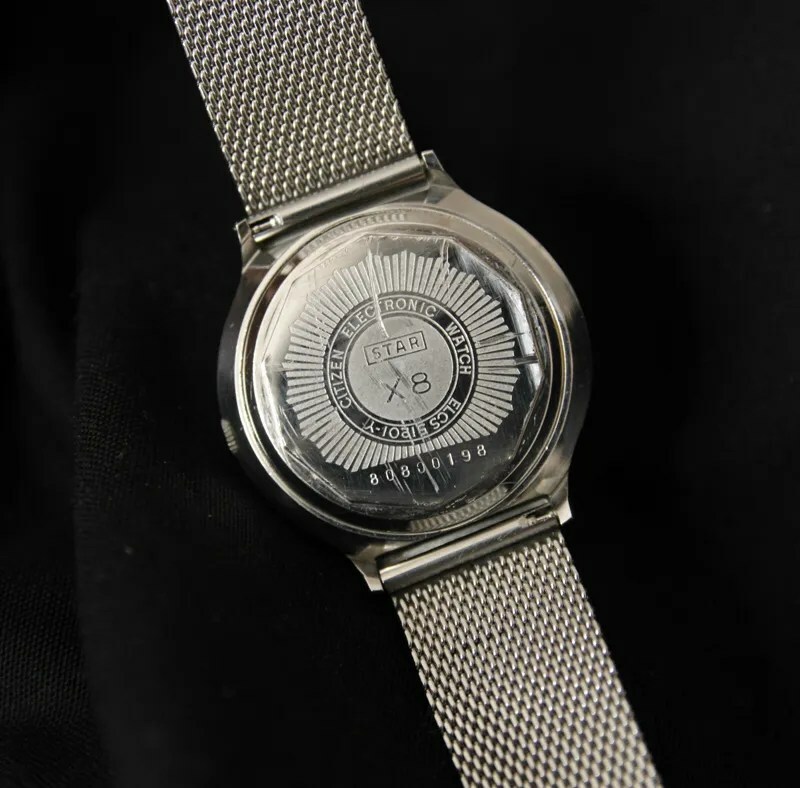 I really can’t find if this watch which I fell in love at the moment I saw, is real. I’ll try to send pictures if let me so, Thanks very much. Where can I sen pictures? 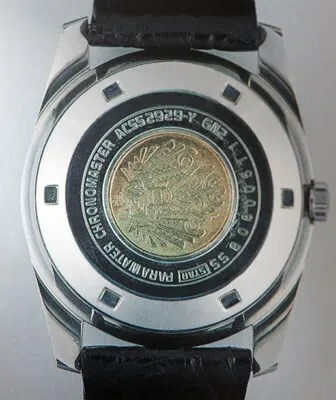 Does the Chronomaster Special auto day date 35 jewels model come with the strap with leather insert on buckle? Could you advise if all the date models have quick set date function? Looking at getting one of my own. Hi, thanks for visiting my blog. The automatics have quick set date, but not the day on those models with day function. 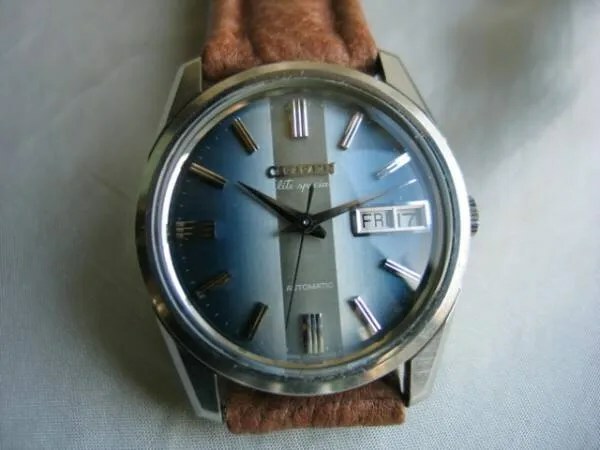 As far as I know the hand winding date only model is not quick set. Thanks Steve for the information. Looking forward to getting my own. I just don’t understand why the seconds hands is so short on these models. 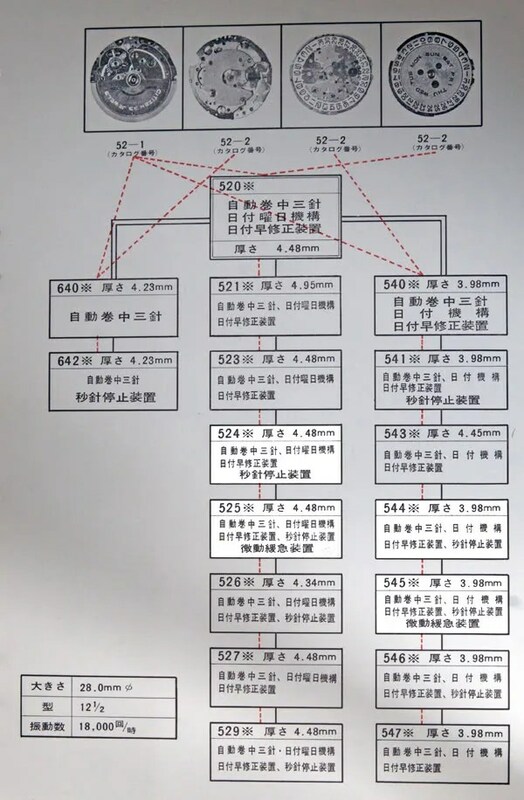 Do you have any idea the underlying rationale? 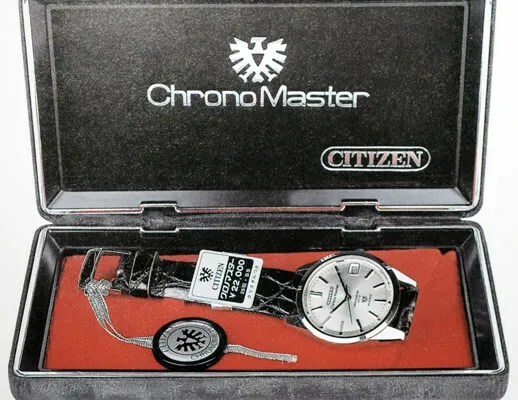 BTW Stephen, I gotten my own Chronomaster and I suspect it came with the original strap but not the original buckle with inlaid leather. 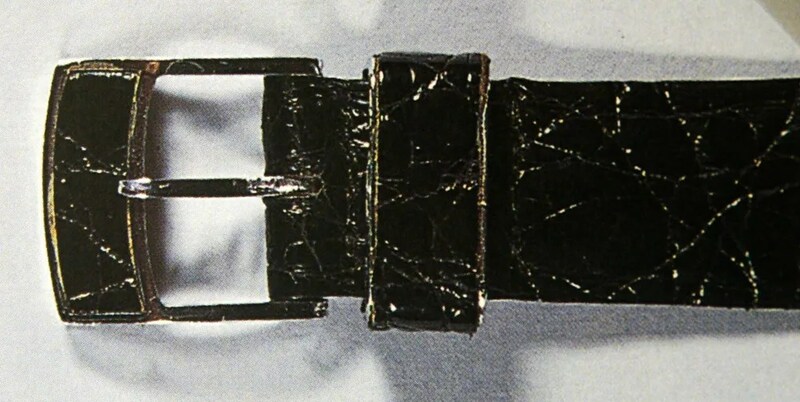 Am I able to send you pictures to verify the strap? Thanks. Sounds good! My email is ************. Thank you so much for your patience! Is there any difference in the movements of ” Chronometer ” and ” Chronometer Superior” ? How are you? 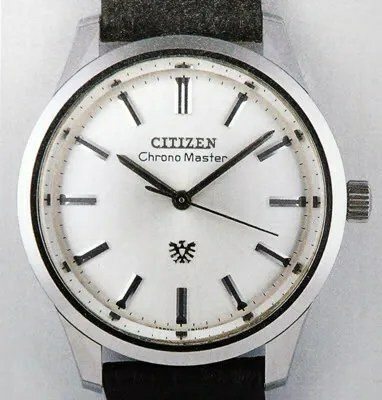 I want to ask you about the glass on the Chrono Master, I have seen it is mineral but do you have some more information or where I can purchase an original? My model is the 5440…. You’re welcome – good luck with the auction!